Two-up two-down was introduced between the Football League and the Nationwide Conference for the first time in 2002/03. 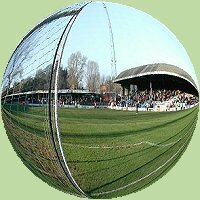 Shrewsbury and Exeter City occupied the bottom two positions and were relegated from the League, their places being taken by Yeovil Town and Doncaster Rovers - 2002/03 Conference table and play off details. Shrewsbury spent one season in the Conference before regaining their Football League place through the play-offs at the end of 2003/04 (2003/04 Conference table and play-off details). * Shrewsbury were drawn away to Oswestry Town in the Preliminary Round of the FA Cup in 1950/51 but they withdrew from the competition, refusing to play in the qualifying rounds after having been elected to the Football League. ..that two Leicester City players once scored a unique goal - a shared own goal!